ADJ will use the LDI (Lighting Dimensions International) entertainment technology show in Las Vegas, which opens its show floor today (Friday the 21st of November), as a chance to debut more than 25 of its latest products. Details of three of these new units have already been announced ahead of the show: the 5P Hex, Illusion Dotz 3.3 and Fog Fury Jett. Following the success of its predecessor, the 5P Hex, visitors to the ADJ booth at LDI will finally get the chance to see the 12P Hex – a versatile par fixture with a lie-flat design – in action. With twelve 12-watt hex-LEDs, the 12P Hex generates impressive power and lets users create distinct colour wash effects. Mobile DJs can utilise the UV element when catering for younger audiences, while the white and amber tones are always popular for weddings. A range of positioning options makes the 12P Hex ideal for lighting stages, both from above and from the ground, or for lighting dance-floors, venues and other event features, such as marquees. ADJ’s new patent-pending body design sees the unit’s IEC and DMX in/out sockets positioned on one side; convenient when it comes to up-lighting walls, marquees, stages and décor. This ‘lie flat’ design also allows DJs to set the unit inside truss for effective truss-warming, or behind scrim for glow effects. Also on display at LDI will be ADJ’s Illusion Dotz 3.3 – a more compact version of the Illusion Dotz 4.4. 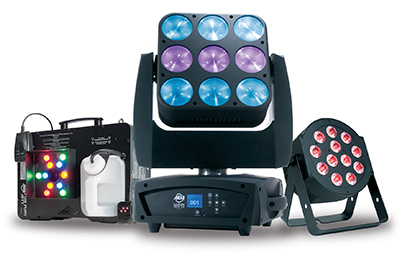 Consisting of a 3x3 COB LED matrix mounted on a moving head yoke, the Dotz 3.3 is a totally pixel-mappable fixture that offers compact power, flexibility in movement and the ability to create animated patterns. The unit’s Artnet/Klingnet compatibility allows users to project low-resolution video content across the COB LEDs using software like Arkaos Media Master Express, Media Master Pro, and LED Master. Mobile DJs can also use the Illusion Dotz 3.3 as a wash fixture, with its 30-watt tri-colour LEDs and 15-degree beam angle able to create wide-spread washes of colour – great for washing dance-floors and stages – as well as more concise audience-facing beam effects. Offering something different to such wash effects as the 12P Hex and Illusion Dotz 3.3, ADJ will also be showcasing the brand new Fog Fury Jett, taken from its Fog Fury line of fog machines. The Fog Fury Jett is a high velocity, DMX-compatible, vertical fogger that uses 12 quad-colour (RGBA) 30-watt LEDs to infuse its fog with colour. As with many other machines in the Fog Fury series, this new addition features a high performance Italian pump system for optimum output, a heating element that uses an oil-type transmission throughout the pipeline to prevent clogging, and ADJ’s ETS (Electronic Thermo Sensing) technology to maintain optimum heat levels and give a warm-up time of nine minutes. Mobile DJs looking to enhance their lightshow with fog will be impressed by the Fog Fury Jett’s output of 20,000 cubic-feet per minute – enough fog to effectively fill any medium-sized venue. This, along with the fact that the 3-litre external fluid tank can be mounted on the front or rear of the unit, means that the machine can be used vertically (pointed up or down) or horizontally, giving mobile DJs a flexible solution to fogging.